A promising new treatment for Zika virus infections has been developed, which has been shown to be effective in mice. Scientists at Nanyang Technological University in Singapore in collaboration with researchers at Brazil’s Federal University of Minas Gerais and Ghent University in Belgium have engineered an antiviral peptide that bursts the lipid membrane surrounding the virus. The Zika virus membrane is smaller than that of mammalian cells and is more curved, which allowed the scientists to engineer a peptide capable of selectively bursting the viral membrane without having a similar effect on the larger, flatter mammalian cells. If enough holes can be made in the lipid membrane, it is possible to rupture the virus. The peptide can also cross the blood-brain barrier, which is particularly important for Zika as the virus targets the brain and central nervous system. This antiviral treatment differs considerably from most other treatments for viral infections, which work by preventing viral replication. The prevention of replication is effective, it does not remain so for long. Viruses can mutate which renders such treatments obsolete. When mutations occur, they can easily result in an epidemic as vaccines and treatments no longer work. The new approach therefore has much greater potential. If the Zika virus mutates, the treatment will still be effective. Further, it should be possible to use the same technique to treat infections of other mosquito-borne viruses (flaviviruses) such as Dengue, Chikungunya, and Yellow Fever. All have a size of between 40 and 55 nanometers and are surrounded by a burstable lipid membrane. The Zika virus was first identified in 1947 in Uganda, and there have been many outbreaks around the world over the past 7 decades, notably in Brazil in 2015/2016. 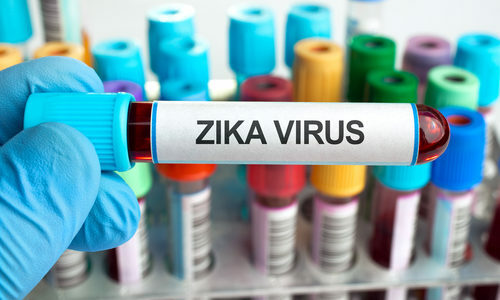 In 2015, the Zika virus was found to trigger Guillain-Barré syndrome and Zika virus infection during pregnancy was shown to cause congenital birth defects and microcephaly. Usually however, people infected with the virus experience no symptoms or mild symptoms that last up to 7 days. While there is no treatment for Zika virus, symptoms such as pain and fever can usually be managed. The scientists’ treatment for Zika virus infections was shown to be effective in mice and both reduced symptoms and improved survival. 10 out of the 12 mice that were administered the peptide survived. All mice in the control group died within a week. The researchers now plan to conduct further trials on larger animals and hope they will soon move on to clinical trials on humans. The research is detailed in the article – Therapeutic treatment of Zika virus infection using a brain-penetrating antiviral peptide – which was published in the journal, Nature Materials on October 22, 2018.